In this week's Diva's Challenge, the guest blogger, Erin Olsen, has a fun challenge! I've always loved mandalas and zendalas but was intimidated to create ones from scratch. But Erin has provided us with a template! The template as well as other examples of this week's challenge from all over the world can be found here! For mine, I started with festune in all the circles and purk in the "eye" shapes. The rest were filled with auras (means to follow around or within a shape). 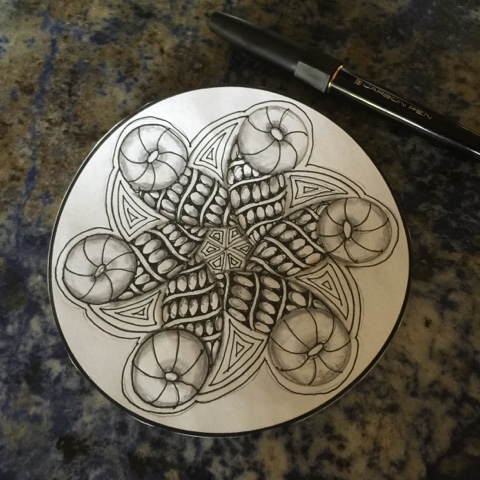 I hope you give zentangle a try. It's totally addictive, very relaxing, and anyone can do it! Nice tile! I don't usually like festune but you did a great job with it. I do love Purk! It's a favorite of mine. Your zendala is lovely! The shading is nicely done. Very beautiful, I keep looking at it. I like the way it darkens into the center. i like the way you used Purk on this, it really works well. Festune is a pattern I haven't used much but I think you've set me a challenge of your own now. I think this is something I could do if I set my mind to it. It somehow just makes sense to me. However, it would not come out looking like this one by you, Yukari!! Beautiful work. I think the auras were a very good idea. I used tangles in all the spaces and I think the result was too dense. The auras give your composition a nice lightness. Wonderful zendala! Fine choice of tangles! Beautiful lines, very gently softened by great shading. I love how you contrasted the very fat looking Festune and Purk with the flatter looking auras in the spaces. This is really nice! Nicely done! I love the simplicity of festune in the circles balanced with purk.